With the holiday soon upon us, we need to start planning our training! Get your Kettlebell fix when you can- especially if you’re off work! This year, the school will close and lock down from 5pm on Friday, December 21st and will re-open at 7am on Thursday, January 3rd. We will resume classes on Sat 5th Jan, 2013. NEW YEAR – NEW YOU BOOTCAMP IS HERE! Bigger and better than ever…now in its fourth year, we make a promise most bootcamps can’t ever make! If you’re not happy with the results, you get ALL your money back! Existing Members– only pay £48 to join the bootcamp! Contact Christian today! Fed up with the mass- market option for Hummus out there, I decided to make my own today. The main problem is the consistant use of cheap oils in most supermarket and deli versions of this delicious dip. Olive Oil is the only way to go, and as far as I’m aware only Marks & Spencers do an Olive Oil only version! So the best way to ensure your Houmus (or Hummus) doesn’t contain any crap? Make your own! Its easy! All you need is a food processor or quality blender and the following ingredients…..
PS: Our next bootcamp will be in January….the New Year- New You programme allows you to eat delicious recipes like this alongside some wicked training! For more info e-mail Christian on christian@brightonkettlebells.co.uk. In response to high demand….here is the famous Spelt Bread recipe! This is one of the recipes allowed on our Guaranteed Results bootcamp, where we avoid Wheat! Get involved- get on it- toast it! – Rub butter into flour and add salt, and stif in yeast. – Bake in a pre-heated oven at 230oC for half an hour. You can also add dried fruit and nuts for a sweet bread. Great toasted with eggs for breakfast, or as a snack with Peanut Butter on! New venue for classes in Hove are a hit! Now in its second week, the new location for our Hove classes have become a hit! St Phillips Church is the ideal venue for our classes with plenty of space for us all to move around! Furthermore we can have the doors open allowing fresh air to flow around the room. Parking is free after 8pm in the surrounding area, and you can always grab a space round the back for the Wednesday class. If you haven’t already, be sure to pop down to check it out! We’re thinking of starting a morning class on Fridays in Hove. Before we do I’d like to know…would you come? And what time would suit you? WARNING! Is your trainer qualified to teach? Oh dear…I’ve just spotted yet another trainer advertising Kettlebell training in my area- who is NOT qualified or certified to teach them. How do I know? I asked them! Don’t get me wrong- I love some healthy competition, its good for business. But it is worrying when Personal trainers tout themselves as Kettlebell trainers, leaving you (the client) exposed to malpractice and potentially injuries which are inevitable when Kettlebells are used incorrectly. Furthermore, we the Kettlebell community will be blamed for a list of injuries caused by other’s mistakes. What some trainers don’t realise is that Kettlebell training is very different to conventional gym exercises. Certain muscles must be used to avoid pressure on the wrong areas and joints. Speed and tempo, along with correct breathing are essential components in kettlebell training. When I qualified as a Kettlebell trainer, I pretty much had to throw out what I had learned as a Personal trainer. Isolation is something I focused on in the past, now I’m all about working the whole body- in dynamic and explosive movements. As with any exercise, if you use the wrong muscles, and have bad form when training with kettlebells you WILL get injured. Kettlebells are an art that must be taught to you by someone who is personally proficient in their use and qualified to do so. 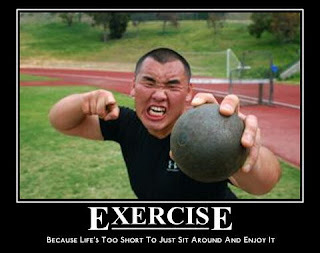 If your Personal trainer is qualified to teach kettlebells- they should state this in their bio or website. There are only a handful of certifications which are acceptable. Sometimes I’ll hear the arguement: “I don’t need to certify, experience counts for far more than a certificate”. To a certain extent this is true, but how can you guarantee experience and that they’ve been doing things correctly? Bad habits die hard. Furthermore, if your trainer is commited to their self-development and expansion of knowledge why would they not become certified to teach? The Brighton Kettlebells team (Mark Stroud, Rooth Smethurst and Hannah Quinn) have invested thousands of pounds on our self- development, and this is what you should demand from your trainer or bootcamp coach. I sell kettlebells. I sell to gyms, training facilities, individuals and even personal trainers. Whenever I sell kettlebells to trainers I ask them if they are qualified to teach…sadly many say NO. What they do is watch a few videos on youtube and teach themselves (wrongly) how to train with them. With these guys I’ll ask them to show me a simple kettlebell swing. What follows is usually a terrible display of mis-understanding of what kettlebells are and how to use them….too much backward lean at the top, kettlebell too high at the top of the arc, back bent over and no hip extention- its like a car crash. I’ll then recommend they do a few sessions with me, or even better: do a Kettlebell certification, to which most reply: “its too expensive” or “I don’t have time”! These trainers are jumping on the band wagon- and you’ll pay the price if you train with them or attend their classes. If you’re attending a class or bootcamp which involves kettlebells, or being trained by a trainer who uses kettlebells as part of their service, ask them if they are qualified by one of the above organisations. Furthermore, ask to see their certificate proving their qualification. It still shocks me how no one asks to see my well earned certificates! Its crazy! Its like allowing a non-Corgi registered engineer to service your boiler….you just wouldn’t do it! If the trainer is operating outside of a gym or training facility, they will need adequate Civil liability insurance which covers their legal liability to you (the client) for death, injury or illness to others and loss of, or damage to third party property. This is important and you should ask to see the certificate of cover checking dates on the paper work. Brighton Kettlebells prides itself on the high standard of all the instructors taking their classes, all of which are not only qualified and certified, but insured for peace of mind. Furthermore, we constantly evolve, investing money to take on new certifications, keeping up with the latest trends and learning new training forms. Now go ask your trainer: Are you qualified to teach?